Materials and Technology for Sportswear and Performance Apparel takes a close look at the design and development of functional apparel designed for high-performance sportswear. Implementing materials, performance, technology, and design and marketing, the book examines this rapidly emerging textile market and outlines future directions and growing trends. The book begins by explaining how a comfort-driven focus has led the industry to embrace knitted fabric as a popular choice of constructional material. Using examples of leading brands, it outlines the basic terminology, structural details, and essential properties appropriate for performance apparel, especially for sportswear. This book describes the differences between woven and knitted structures, provides an understanding of fabric behavior and the characteristics of a functional garment, and outlines the importance of garment fit and consumer perception of garment comfort in its design and development. The authors present key research outcomes on the design and development of functional apparel designed for high-performance sportswear that explore smart materials, impact-resistant fabrics and pressure sensing. 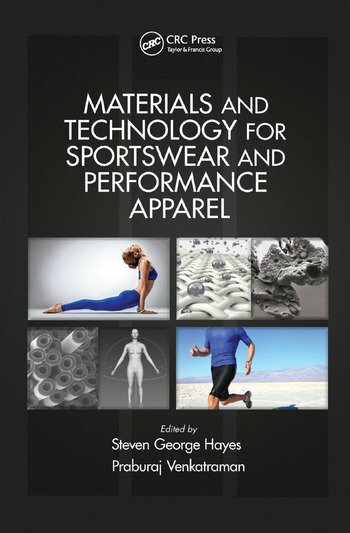 They consider the use of 3-D body scanning and its influence on pattern engineering for apparel product development; highlight the widely used fiber types for sportswear and the importance of fiber blends and their performance, and discuss the relevance of fabric structure and its interaction with the human body. The book also presents research on moisture management and temperature regulation and analyzes the performance and development of smart sportswear intended for monitoring health and performance for a range of end uses. Steven George Hayes is principal lecturer for technology in the Department of Apparel at the Hollings Faculty, Manchester Metropolitan University, where he is responsible for the management and development of their technology provision for all aspects of learning and teaching, research and enterprise. In 1997 he took up the post of senior lecturer (manufacturing technology) within the Department of Clothing Design and Technology at Manchester Metropolitan University. As principal lecturer for technology since 2008 he has been responsible for the management and development of technology provision for all aspects of learning and teaching, research and enterprise. Praburaj Venkatraman is a textile technologist and a chartered member of the Textile Institute, a senior member at AATCC (American Association for Textile Colorists and Chemists) and a professional member of ITAA (International Textile Apparel Association) US. He earned a BTech (Textile Technology) from KCT (Kumaraguru College of Technology), Coimbatore, India, an MSc in Technical Textiles (2001) and his PhD in Medical Textiles (2005) both from the University of Bolton. Venkatraman has been a senior lecturer in textile technology at the Department of Apparel, Manchester Metropolitan University (MMU), UK, since 2010 and he has led the BSc (Hons) fashion materials and technology program since 2012. "Reading this book will help students understand the sportswear industry, so important for today’s student. … A must have book for any student going in the sportswear industry." "The contents and topics chosen for this book are appropriate and have covered a wide range of areas, and reflected the authors’ research strength and expertise… useful for both students and industrial readers, I believe that such materials will raise a lot of interests from both academics and industries, for both teaching and product development purposes."